Data lakes are next-generation hybrid data management solutions that can meet big data challenges and drive new levels of real-time analytics. Their highly scalable environment can support extremely large data volumes and accept data in its native format from a wide variety of data sources. 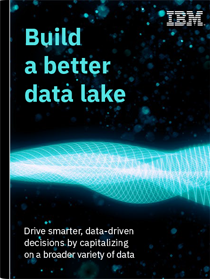 Data lakes can help break down silos, enabling organizations to gain 360-degree views of information and conduct cross-department, office or regional analytics. They also enable adoption of modern technologies such as artificial intelligence (AI) and the Internet of Things (IoT). Improve data discovery, testing, ad hoc and near real-time queries, supporting predictive and prescriptive analytics for today’s AI. Use a single ecosystem of products and services benefiting from the combined IBM and Cloudera collaboration and investment in the open source community. Build your enterprise-grade, open AI data and analytic platform, harnessing machine learning and disparate data to drive better data-driven decisions. Benefit from industry-leading security and portability across your hybrid and multicloud environment when accessing, storing and exploring data. Reduce the time and cost spent on data preparation in a data lake that stores data in its original format. Use semi and unstructured data and provide users with the tools for real-time, self-service access necessary to drive AI and IoT. Use commodity hardware when building your data lake to drive unlimited scalability and decrease capital expenditures. Save additional costs when using the data lake as a repository for older data that would otherwise take up capacity in a more expensive data warehouse. Federate and analyze data from more sources for deeper insights and more accurate results. Data lake governance features help ensure data is relevant and trustworthy. 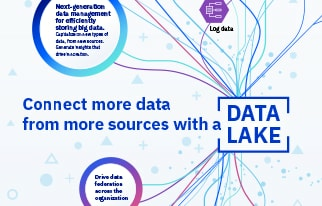 Coupled with real-time analytics and AI capabilities, the data lake allows your organization to seize new opportunities as they unfold. Increase compute and storage efficiency and maximize performance when building out your Hadoop data lake. Optimize your storage capacity and protect, secure and efficiently move data in your hybrid environment. 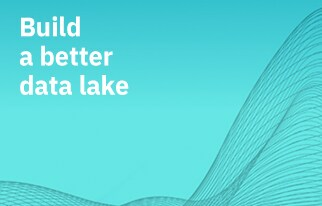 Optimize your data lake using an industry-leading, enterprise-grade Hadoop distribution offered by IBM and Cloudera. Ensure the integrity of your data lake using proven governance solutions that drive better data integration, quality and security. Use an enterprise-grade, hybrid ANSI-compliant SQL on Hadoop engine to deliver massively parallel processing (MPP) and advanced data query. Replicates data as it streams in — so files don’t need to be fully written or closed before transfer. Build and train AI and machine learning models, plus prepare and analyze data — all in a flexible, hybrid cloud environment. Learn about best practices and potential pitfalls when integrating a data lake in your existing data infrastructure. Understand the importance of enterprise-grade security and governance when using a growing diversity of data. Discover the new types and sources of data that can be used by integrating data lakes into your existing hybrid data management strategy. Data lakes allow you to tap into unstructured data and generate insights from real-time ad hoc queries and analysis. The January 2019 merger of Hortonworks and Cloudera is expected to shape the future market for big data and analytics. Read how the continued strategic partnership between Cloudera/Hortonworks and IBM can benefit our mutual customers.